Chris Drury now has agreed to allow the New York Rangers to buy out the final year of his contract and will seek to continue his NHL career with another club. Drury sent a letter to the New York Post, thanking the Rangers organization and the team’s fans for their support during his four seasons in New York. Fellow sophomore Charley Coyle, whose rights were traded to Minnesota, discussed future plans with The Boston Globe. 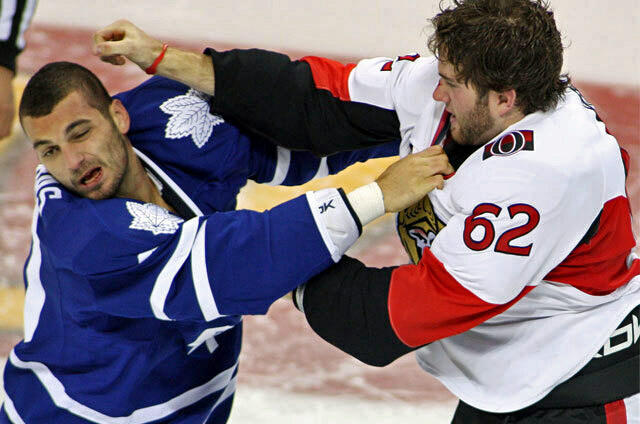 Alex Chiasson is headed to another Dallas Stars development camp while 2012 prospect Matt O’Connor, a goalie with Youngstown/USHL, has been invited to the Ottawa Senators rookie camp. The 9th Annual Mark Bavis Leadership Foundation Golf Event will be held at Mashpee, Mass. on July 25. Established on honor the memory and principles of BU standout Mark Bavis, killed in 9-11 hijackings, the foundation provides educational grants to deserving young men and women. Click here for event details and further information about the foundation. Former All-American goalie and Hockey East MVP John Curry has departed the Penguins organization and has signed to play next season with the Hamburg Freezers in the German DEL. 2013 recruit Adam Erne finished tournament play at the Select 16s with three goals and one assists in five games, and he earned a spot in today’s all-star game. Rising sophomore Adam Clendening, Matt Nieto and Garrett Noonan were selected by NHL teams on day two of the entry draft. Clendening was taken in the second round, 36th overall by the Chicago Black Hawks, whose head of amateur scouting is Mark Kelley, son of legendary Terrier Coach Jack Kelley California native Nieto was taken 11 picks later by San Jose and Noonan, who hadn’t been ranked by NHL Central Scouting was Nashville’s second pick in the fourth round, #112 overall. Paul Fenton, a former Terrier forward and current Nashville assistant general manager, noted that the Preds’ Chief Amateur Scout Jeff Kealty, also a former Terrier and, like Noonan, a Catholic Memorial High School product, had emphatically urged the club to select Noonan. Terrier head coach Jack Parker was in St. Paul to support Clendening and Nieto who were at draft headquarters with their families. USCHO’s Jim Connelly caught up with Parker to discuss his young stars’ future prospects. The Boston Globe’s Fluto Shinzawa reported that Minnesota Wild GM Chuck Fletcher is not planning to lure newly acquired Charley Coyle to join the pro ranks. Harvard graduate. “It’s up to the young man and his family to make that decision. “We’ll certainly sit down and speak to him. We’ll speak to Jack Parker and we’ll try to go through the process of assessing where exactly he’s at and be up front. 2013 recruit Adam Erne is participating in USA Hockey's Select 16 Development camp in Rochester, N.Y. and earned kudos from Amateur Hockey Report for his first-day efforts. WhiIe Adam Clendening, Matt Nieto and Sahir Gill await selection in the 2011 NHL entry draft, a Terrier selected in the first round last year had his rights traded. Charley Coyle, the Sharks’ top pick (28th overall) in 2010 was part of a multiplayer deal with the Minnesota Wild. The Niagra Gazette spoke with Clendening about where he might be selected. The Long Beach Press Telegram and Fox Sports West interviewed Nieto, one of the increasing number of Californians with a bright NHL future. Hockey Scout Dan Sallows conducted a Q&A interview with Gill. The Hockey News and Sallows both profiled 2012 recruit Robert Polesello, who after a standout season with the OPJHL Vaughan Vipers, will play for the USHL’s Indiana Ice next season. He’ll join 2013 recruit Adam Erne who completed his first USHL with the Ice. Erne, a second round choice of Halifax in the QJMHL draft, recently participated at Indiana’s main camp along with Polesello and another 2013 recruit, Rob Baillergon, who played for Cushing Prep last season. The Terrier women’s team announced its 2011 recruit class including Isabel Menard, a junior transfer from Syracuse where she was the Orange’s top scorer. Former captain and all-time leading scorer Gina Kearns was named an assistant coach at Penn State whose program goes Division 1 in 2012. The New York Post reports that former Terrier captain and Hobey Baker Award winner Chris Drury is suffering from a degenerative condition in his left knee that likely will prevent the Rangers’ captain from playing next season and possibly ending his career. The Rangers had planned to buy out the final year of Drury’s contract, but the medical situation prevents this. Drury is BU’s all-time goal-scoring leader (113) and is third on the all-time points list (214). A member of BU’s 1995 national championship team, he was the NHL’s Rookie of the Year in 1998-99 and won the Stanley Cup with Colorado in 2001. BleacherReport looked back on Drury's career. 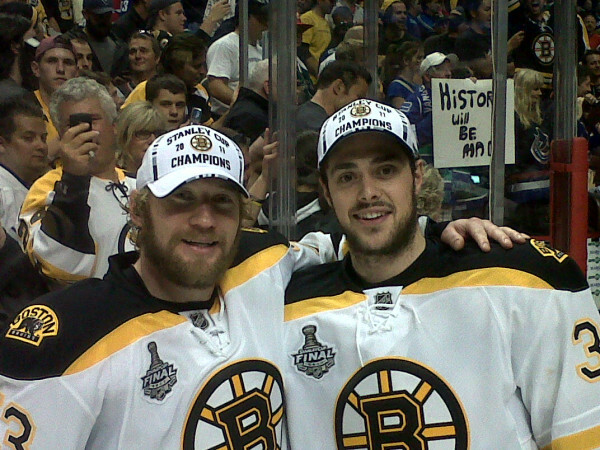 ►No former Terriers were on the ice for the Bruins when the won the Stanley Cup in Vancouver last week, but Colby Cohen (in photo with Michael Ryder) one of several reserves called up from Providence, was in the Arena and in uniform, celebrating Boston’s first Cup win since 1972. Cohen, who scored the game-winning overtime goal in BU’s 2009 NCAA Championship game winner against Miami, played 46 games for Providence after his mid-season trade from Colorado. He was joined on the ice during the celebration by former Terrier Eric Thomassian. ►Sahir Gill who scored 25 points as a freshman for BU was interviewed by The Hockey Spy blog. ►2013 recruit Brendan Collier led the New England Nordiques to the championship of the the 2011 NH Jr. Monarchs Summer Showdown, scoring the clinching goal in a shootout of a 1-0 game.Collier also had a hattrick and an assist in the quarterfinals. Another 2013 recruit, Adam Erne also skated for the Nordiques. Patch interview with Collier. ►USHR reports that former BU captain Albie O’Connell, an assistant coach at Northeastern, may be in the running for a similar post at Harvard. Reports today indicate that Northeastern head coach Greg Cronin will depart to become an assistant coach with the Toronto Maple Leafs. Blaise McDonald, an associate head coach at BU before he became head coach at Lowell, may join former Terrier Don Cahoon’s staff at UMass as an assistant. ►Andrew Glass who played two and a half seasons for BU will continue his college hockey career at Canada’s Carleton University. Details from The Boston Hockey Blog. ►2012 recruit Marc Hetnik, Jr., was a recent recipient of the Commitment to Excellence Award at Catholic Memorial School's 51st commencement exercises. He was one of eight seniors to receive the award recognizing devotion to academics and athletics. ►Rising sophomores Charlie Coyle, Adam Clendening and Matt Nieto are among the 40 players named to this summer’s USA Hockey National Junior evaluation camp in Lake Placid. All three also were camp invitees last summer, but only Coyle was named to the final roster of the U.S. Junior National Team. 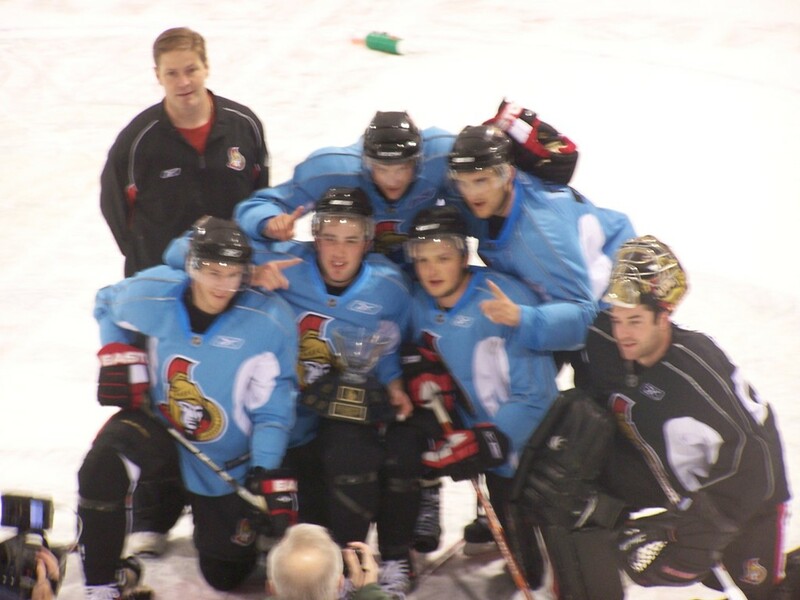 Former Terrier defenseman Eric Gryba (right in photo) finished his first full pro season on a high note as the Binghamton Senators won the AHL’s Calder Cup championship Monday night, defeating Houston four games to two. In 66 regular season games, Gryba scored seven points and added one more in ten playoff games. On June 5, Senators assistant coach Steve Stirling, captain of BU's 1971 national champions, underwent successful quadruple bypass surgery and, according to the Senators, was resting comfortably. ► NHL.com interview with Nieto at the combine. ► The Scouting Report has ranked Clendening and Nieto 36th and 43rd respectively for the upcoming NHL entry draft, set for June 24 & 25 in St. Paul, Minn.
Terriers Wade Megan, Ryan Santana and Ross Gaudet each had their heads shaved at Gillette Stadium in Foxboro Sunday to raise money for the One Mission Kids Cancer Buzz-Off which benefits the Children’s Hospital Boston's Pediatric Oncology unit. The rest of their BU teammates were on hand for the event. Megan has established a donations Web page for One Mission, Inc.
Anthony DeAngelo, who had been a 2014 recruit, has now signed on with Sarnia of the OHL. Adam Erne, a 2013 commit, was picked by Halifax in the second round of QMJHL draft. Fosters.com reports that former BU All-American defenseman Freddy Meyer, who has been in the NHL since 2005, is considering a move to Europe next season. Injuries limited him to 15 games with Atlanta last season. Former Terrier goalie Jason Tapp has been named an assistant coach by Union College’s newly appointed head coach, Rick Bennett. Tapp, whose minor league career ended in 2009, was a volunteer goalie coach for the Dutchmen during the past two seasons. Could an expansion be in Hockey East’s future ? With upcoming establishment of a Big Ten hockey league, some CCHA clubs may be seeking a new home. One report suggests that Notre Dame may be eyeing Hockey East.